Presenting Lenore showcased a book a couple of months ago that I finally got around to getting from the library and it's a beauty. 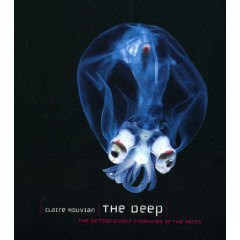 The Deep: The Extraordinary Creatures of the Abyss by Claire Nouvian is a huge coffee-table sized book full of photographs (220 of them!) and informative text about many of the world's amazing deep sea creatures. As I studied marine biology, this book was of special interest to me. Though I have seen photos of most of these creatures already through the fantastic work of the scientists at MBARI, this is still a worthwhile collection. The black backgrounds bring out the detail of even the most microscopic creatures. While the pictures are available to all ages, the text is written at a fairly high level with a lot of scientific names, sizes and depths. I think this book would hold the most interest for those already familiar with creatures like siphonophores, tube worms and brittle stars. If you would like to see a sampling of the amazing photos, head over to The Deep website where you can see creatures like this beautiful Mertensia ovum, a ctenophore. Support our site and buy The Deep: The Extraordinary Creatures of the Abyss on Amazon or find it at your local library. Cool! That's awesome that your library had it. What other sea creature books did you get? Lenore - I don't have any others right now. I'm really looking for something good for kids that isn't just a giant squid book. The smaller creatures are just as interesting! Totally cool! My son would LOVE this! Did you see that series Planet Earth a while back? They had some really neat footage of the strange creatures in the abyss and my son was just obsessed with this thing we simply called "The White Thing." It was so weird looking. I'll be honest ... many of the creatures you find down there give me the creeps. I remember on Planet Earth seeing the dumbo octopuses and having nightmares about them ... yes, nightmares.